Always boil pasta and vegetables in water with a dash of salt (I knew that but I forgot). Cook asparagus in boiling water for just a few minutes til it gets limp "How you want your asparagus, but not your man," said the cook. He cracks me up. Then immediately put in ice cold water so it will stop cooking. Cut unripe peaches in half, saute in butter, reduce honey, fry peaches in the sauce. Then bake. DE-licious! An easy way to cut bell peppers: slice of the bottom. Then (with it upside down) you can easily cut the sides away from the core. It actually works!! That was my favorite tip. There is this great Italian dehydrated sausage that you should keep onhand and cook with small bits of it to add flavor. I have to ask for the name of it again and add it. sorry. Now let me tell you what I know about the food pyramid. I knew that the old pyramid was bad advice loooong before they changed it to the new one. I know that the new one isn't so great either. I know that it's dumb to have dairy in there because 1/3 of the world is lactose intolerant. I know that the only reason that they have dairy in there is because the dairy industry is a powerful lobbyist and most nutritionists are not correctly informed (thanks to dairy lobbyists). In fact, the first day when I introduced myself and a little about my family's diet and I told them that we don't drink milk; everyone chimed in with questions and advice like: have you tried soy milk? And I wish I had said "we don't drink dairy because dairy is not good for you. And soy milk isn't great for you either. Don't believe me? Look it up." But I'm more polite than that. (In person anyway. lol). Not that I don't like dairy. We eat tons of yogurt, kefir and cheese. I know that the food pyramid doesn't clarify the most important issue, which is that crackers, and muffins and basically 90% of the carbohydrates you can buy in shopping market isles are not properly classified in the carbohydrate category, but rather in the "eat sparingly" category. Juice should not be classified as a serving of fruit. It has the sugar, concentrated and none of the fiber. Food groups are actually a completely made up way of categorizing food. There is no basis for it whatsoever. There are only three macronutrients: carbohydrates, protein and fats. 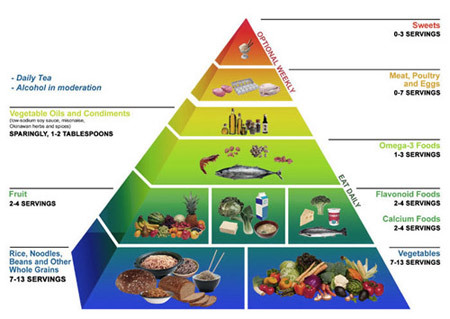 I know that there are food pyramid's designed for various ethnic diets. So basically, it's a torturous hour (actually, it's kind of like what nursing school was like for me, only worse). I guess, though that really these cooking classes are a way for the government to provide nutrition information for poor, dumb, fat people, and if you happen to be poor, smart and healthy, you can come but it's a privilege and you're just going to have to endure the rest, because the class wasn't meant for you anyway and if you want to tag along they'll let you. But you, my reader, have the best deal of all, because you get to learn all the cool things that I'm learning in class without enduring the degrading nutrition lesson and wasting 1 1/2 hours of your time. I want this so badly! !